The violet is available as an annual or a perennial flowering plant. They are most often grown as an ornamental plant or as edge plants. They are also widely used as ground cover in areas for landscaping. They are also cultivated for their uses in containers and bouquets. There are many varieties available to suite almost any climate. The bloom shape and fragrance may also vary depending on the species. Viola arvensis is a species also commonly known as the field pansy. It is native to parts of Europe but is often considered a weed. This flowering plant has also been cultivated for use in gardens. Viola tricolor is one of the most commonly found garden plants. These delicate blooms are commonly found growing in North America. It originated in Europe, and has been developed for garden centers. This species is known for being able to grow wildly in landscaping. It has a habit of creeping across lawns, making it good ground cover. Blooms are often multicolored and appear blue, yellow or purple. The viola pedunculata species offers a more unusual bloom appearance. It is more often called a pansy or a Johnny Jump Up by gardeners. The petals are wider, and form a larger bloom head than other species. Often grown for ground cover, the violet can be a versatile plant. The plants often prefer shade, making them ideal for shady lawns. Partial or diffused sunlight can also be used to get good growth. Full sun locations may require more water and more careful tending. This may also be necessary for poor soil conditions or hot weather. If temperatures are too hot or cold they may not sprout or grow well. Fungal infections can happen if there is heavy rain or bad soil. Leaf spots may appear and can destroy the ground cover or planting. Infected leaves should be quickly pruned and destroyed when found. If the ground cover becomes too thick, they can be divided and spread. This can prevent overcrowding and reduce roots from choking in beds. It may also be necessary if the ground cover spreads out too far. Violets are often used as a fragrance for many women's products. The scent is often light and delicate, making it popular for soap. It is also often used for lotion and perfumes created for women. Viola blooms are often used in salads or as a stuffing once opened. Some creams and dressings may also feature the essence of violas. They may also be used to decorate the meal as a type of garnish. The leaves and greenery are often harvested to use as a salad mix. These are often bland in flavor and require dressing or flavoring. Some species have been cultivated to have vanilla or mint flavors. 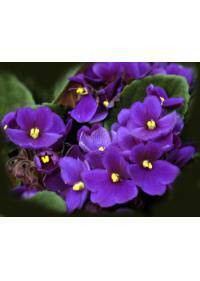 Violets can be ordered in abundance, depending on the season, to be delivered in areas throughout Charlotte, NC, Oxnard, CA, Atlanta, GA, Avondale, AZ, and Colorado Springs, CO. They are usually ordered for bouquets when the sender wants to give something in this specific color. Purple blooms are often associated with wealth, prestige and royalty. A bouquet of purple blooms can be used to congratulate achievements. Achievements may include promotions, graduations or new beginnings. Some may use them as a sign of slight modesty and innocent emotions. They may also represent tender and delicate feelings or thoughts. This gives the violet many uses when choosing an arrangement gift.